Regular readers will know by now how much I've enjoyed using Lutris to bring together my game library across Steam, GOG and more. It just recently put out the big update! There's something so satisfying about having all games on your system, under one roof regardless of where you purchased them. It's the anti-launcher of launchers and it's slick. A much improved user interface. GOG support, which allows you to login to GOG and it will download games for you. The ability to limit the FPS in games when libstrangle is available. 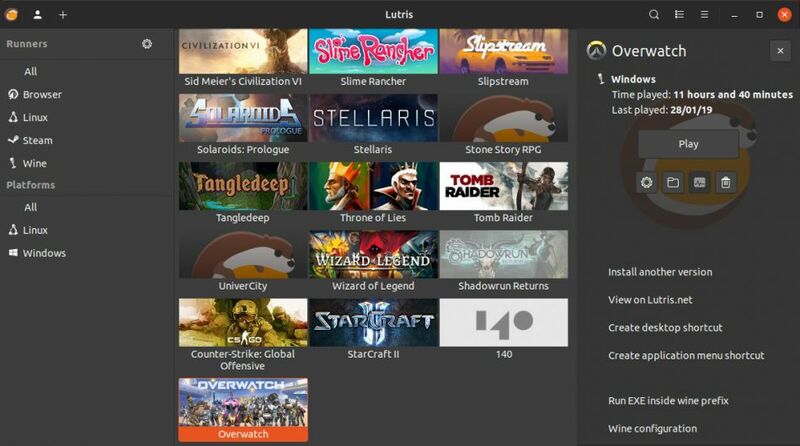 Search for games from the Lutris website, directly in the Lutris client to install them (much nicer!). It's crazy really how long GOG have dragged their feet on getting Galaxy on Linux, so Lutris should help a lot there for those who do shop across different stores. Personally, it's made me more likely to purchase from GOG as keeping tabs on manual downloads is a hassle I don't want. Find the release notes here, official site here. Looks like their official site just had a makeover too. I tried to install a Gog game with Lutris, works very well. Lutris became a "must to have" for Linux gamers with this new major version. I've had a secret love affair with Lutris for over a year now, and I've been eagerly waiting for the 0.5 release. I love the new website so far, and there seems to be a download option for all of the most popular distributions. Like you, Liam, I avoid installing GoG games because I don't like having to manually manage them. I've followed the FAQ and found where to "import" my GoG games, and I get a notification saying that they're imported... but I can't seem to find where to actually install them. Suggestions? Hopefully someone's working on Itch integration. Can't say I'm that much of a fan of the idea that turning the sidebar off means both sidebars vanish. I'd like to be able to turn the one on the right off and just have it show when I need it, but the only options are all or nothing. Edit: I'm getting some weird behaviour where the right sidebar will be replaced by some sort of ferret logo, with no obvious way to get back the previous menu that was there. Also, I was playing Caves of Qud and it didn't recognize when I quit the game. Ended up having to restart Lutris to restore normal functionality. This is great to see the gog support since gog won't give us a client. Does it have Humble Store support? For games that are DRM free downloads from there. Admittedly, many give only a steam key, but it would be a nice thing to have direct download support for those that it is available. stretch611 Does it have Humble Store support? Anyone have this running on KDE, complains of no "Gnome-desktop available" for me. pete910 Anyone have this running on KDE, complains of no "Gnome-desktop available" for me. Can confirm with i3 its the same.